Blox stood there, expectantly, hands on his hips. He glared at us. I stammered a few words. Aahz glared back at him. "Where the hell have you been?" Aahz shouted. "What?" asked Blox, taken aback. "Here we've been," Aahz continued, "just sitting on our cans for the last three minutes..."
"Hours, waiting for someone to give us our tour of the facilities and when the guy in charge...you are in charge, aren't you?" Blox nodded. "When the guy in charge finally decides to show up he accuses us of trespassing! I don't think I've ever been treated so rudely!" "Listen, Pervert. You have no business being here." "Did you hear that?" Aahz exclaimed, turning toward me. "One word, freak. One word and you're gone. Kaput. Vanished without a trace. Do you know who I am?" "Yeah," Blox responded. "You're a Pervert. An uppity one who thinks he can just barge in on my operation and..."
"I don't believe it!" Aahz exclaimed. "Hey, shrimp, get a clue. Where do you think this wood goes? Who do you think buys it? You're talking to Penbrius, magician extraordinaire. I take your wood and make magical staves out of it." "Ah. So what the hell are they doing here?" "These two are my associates, Phlemeist and Noseball." "Phlemeist and Noseball?" I'm glad the Deveel asked, because it would have been silly coming from me. "Hey, what do I look like, their mother? Blame her." "Anyway, I've been having problems enchanting my staves and my contact suggested I come up here and have a look for myself. Now I can see why. With you around, it's no wonder everything is messed up." "Oh, I'm sure. You're probably just incompetent. We have the finest in magical lumber here." "I'll just have to talk to your supervisor. I guarantee you, you've lost my business." "I would rather starve than do business with a filthy Pervert, so it's just as well." Aahz then stormed around and left, Having little choice, we followed him. "Aahz?" I asked, after we had gotten sufficiently far enough away from the camp. "Why did you let that Deveel get away with talking to you like that?" Aahz laughed. "Listen, kid. The plan was to get us out of a sticky situation. And we did. And that's all there is to it." 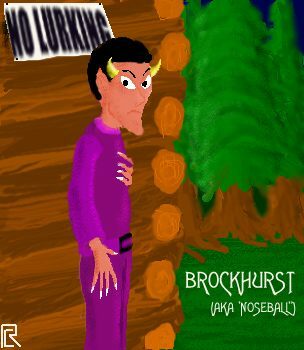 I looked askance at Brockhurst, who was leading us by a distance. I turned to Aahz and asked him a question. "So, what do you think of what Brockhurst told us?" "Well," Aahz replied, "the last time I believed a Deveel and an Imp in the same day I almost didn't survive to tell about it. Something's up here." "So he's lying? Why would he lie to us?" "Oh, I don't think he's lying," Aahz corrected, "I just think he's been misled by someone. He is rather gullible, you know." "Well, we go and find Tananda, Chumley, and Gus, and let them know what's up. Then we decide what to do. I should have known; 500 billion gold was too good to be true." "Oh, sure. Tananda's a trained assassin, Chumley's a great lookout, and Gus is, well, a rock. I wouldn't worry too much about them." And so we headed back for town.